Sega's latest bid for video game dominance: fun while you pee. In the early ’90s, Sega held 65% of the US video game console market, had millions of fans, and was considered one of the premier creators of modern gaming entertainment. Today, they are helping you play with your pee. The Japan branch of the multinational company recently announced that they are testing their Toylets male urinal video game at select locations around Tokyo. Toylets uses a pressure sensor located on the back of the urinal to measure the strength and location of your urine stream. 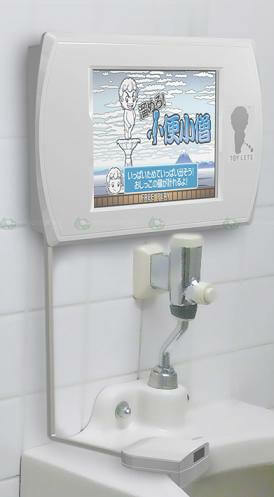 A small LCD screen above the urinal allows you to play several simple video games including a simulator for erasing graffiti and a variation on a sumo wrestling match. 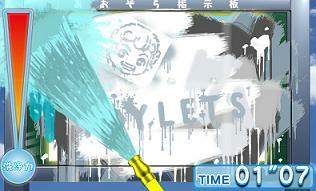 At the end of a game, the screen displays advertisements. Normally when I see something like this I would reach for my enormous “WTF, JAPAN?” flag, wave it around a few times and then return to my life without giving it much further thought. However, I can’t seem to get Toylets out of my mind, because I have a sneaking suspicion that it’s secretly brilliant and maybe even a sign of things to come. Whether you find the concept hilarious, disturbing, or disgusting, urinal video games are simply another way that interactive media could invade every part of our lives. It also shows that no space is safe from digital ads. Don't like graffiti? Who does? Use your urine to wash it away, and compete in this time trial. 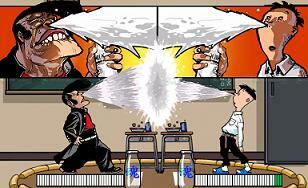 The Milk from Nose game lets you compete against past users for strongest flow. Pee, pee for victory! Getting men to enjoy using a urinal is simply one side of the equation, however. Making money is the other. Digital signs are already in many bathrooms in major cities in the US. I remember seeing them in New York back as far back as 2007. Mostly these ads were ignored like all other things in the Men’s restroom. But what if that ad was part of a video game…you might pay more attention to it then. Making advertisements interactive is one of the ways in which the marketing medium is evolving, and you can see that phenomenon everywhere on the internet from Facebook to pop-up ads. The other big innovation, making ads personalized, is also creeping from the digital world into reality. 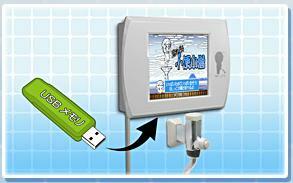 Considering that Toylets allows you to save data to a USB, there are chances we’ll see the same sort of customization available there as well. Oh, sure, you'd want to save your high score... WTF, JAPAN! According to Sega, the Toylets games will be on trial at their testing locations until the end of January 2011. After that, it’s anybody’s guess as to where Sega will take them from there. The era of urinal video gaming could die as quickly as it was born, relegated to the dark corners of WTF history. Or, just maybe, we’ll see more of these interactive bathroom shenanigans in our future. 15 years ago, Sega’s market share fell into the crapper. It would only be fair if the crapper helped them get back on top again.